I’m thrilled to see so many people have taken up the challenge to get ATSC working in Canada with Windows 7 since the untimely demise of the Vista hack. Alas, as time marches on some of the holes that made new hacks possible were plugged and more capabilities were removed from Canadians (notably QAM). 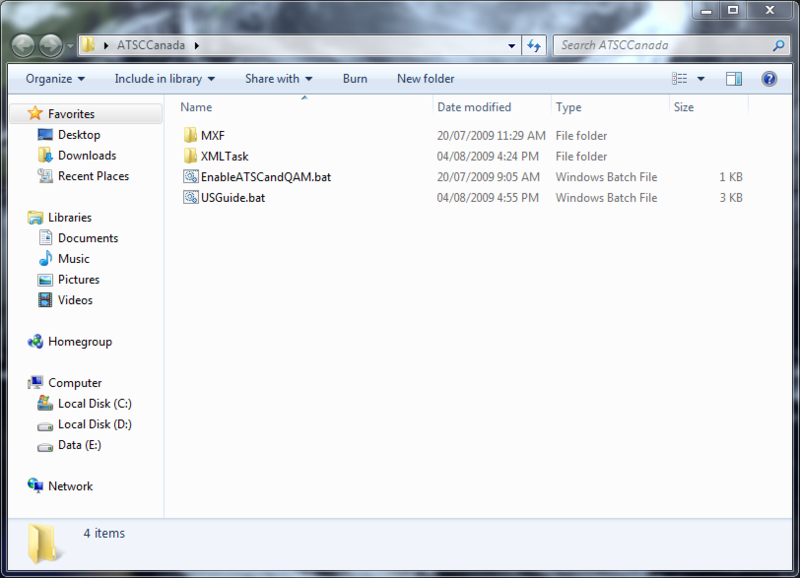 I’m pleased to present this new method to enable ATSC and QAM here in Canada with the release version of Windows 7. First, some background. Like the United States, Canada has decided to transition all television broadcasts from analog to digital. These new digital signals have greater effective range, provide a crystal-clear high definition picture, and as with all over the air network TV broadcasts are free and legal to access. It’s worth noting that over the air signals represent the best high-definition picture quality you can get for network television – better than cable and much better than satellite. While high definition is available for a fee via cable and satellite, those high definition channels are subject to ever-increasing compression and picture quality degradation as they try to squeeze more and more content into your subscription. And unlike cable and satellite, over the air broadcasts are not encrypted and can be easily incorporated into a Media Center setup, copied over to your iPod, and are generally easy to use. The United States has nearly completed their digital transition, and will be shutting down the analog broadcasts in February 2009. Canada is well into its transition, with most major markets now broadcasting in digital and 100% of the country switching over to digital by 2011 before we shut down our analog transmitters. Here in Toronto, I can get access to every major US and Canadian network in full high-definition glory using a $40 antenna that I put in my attic. QAM is very similar except that instead of getting the signals over-the-air using an antenna, the signals travel over your cable company’s network. However in most of Canada this isn’t useful, as Canadian cable companies tend to encrypt or scramble their signal making it completely useless without buying their cable box. There are some lucky regions in the country however who do get access to unencrypted QAM, and for those people it’s a virtual nerdvana of digital TV. Here’s how to get digital high-definition broadcasts into Media Center. 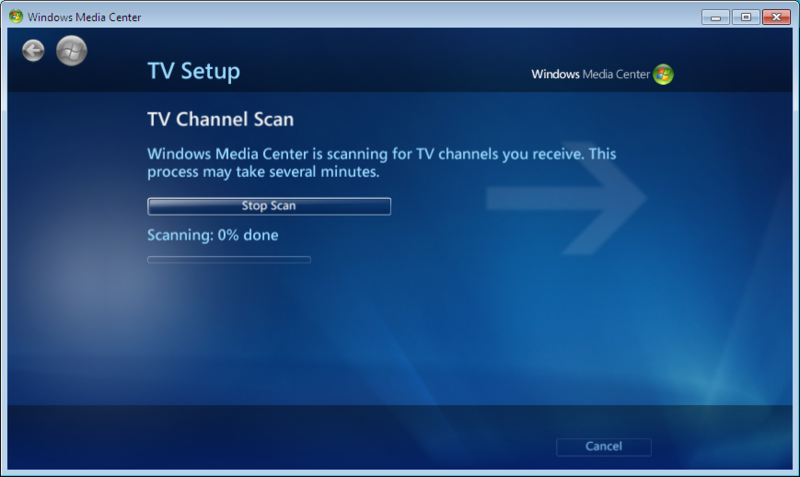 If you’re using Media Center in Windows XP or Windows Vista, follow this link for detailed instructions. 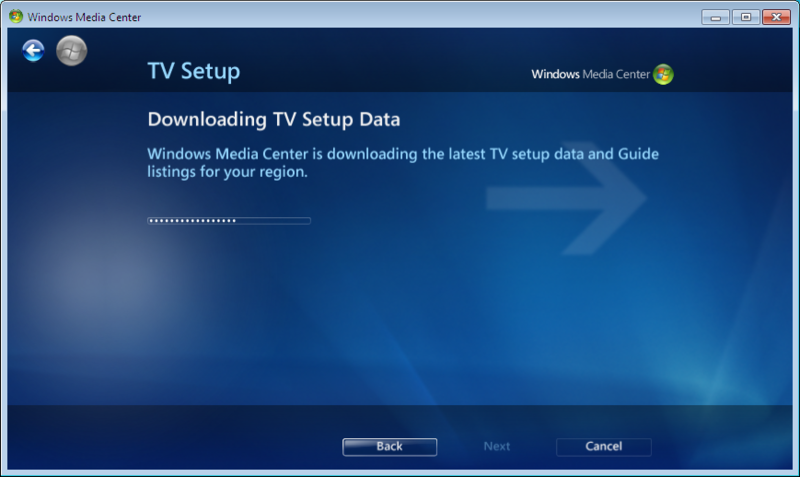 If you’re using Media Center in Windows 7 or Vista with TV Pack 2008, continue reading below. I’ve tried to provide excruciating detail, but don’t get scared. It’s not difficult, I’m just going a bit overboard with screenshots and explanation. For ATSC, you should get a good quality UHF antenna. In most cases I’ve read about it comes down to a Channel Master 4221 or Channel Master 4228 depending on your distance from the transmitters. Consult this handy chart (PDF) to select the right antenna for your area. I personally have a 4221 in my attic which was both easy to do and very neighbour-friendly. For ATSC, you will need an ATSC tuner for your Media Center PC. Any tuner that is supported in Windows Media Center will do. For QAM, you will need a QAM tuner for your Media Center PC. Any tuner that is supported in Windows Media Center will do. None of these items are the sort of thing you can walk into WalMart and find on the shelves, but there are several online vendors including eBay sellers who carry these items. I personally have purchased from Sensuz, a Toronto-area HTPC dealer, and have been very happy with their service. I’ve prepared some files that will automate the process for you. Simply download and extract the provided zip file (click here) to your desktop or any location on your desktop. Double-click on the file “EnableATSCandQAM.bat” which will insert some configuration information into the Media Center database that forces ATSC and QAM tuners to be recognized. I’ll walk you through the setup of the tuner in Media Center, although this isn’t any different than what would normally occur out of the box. 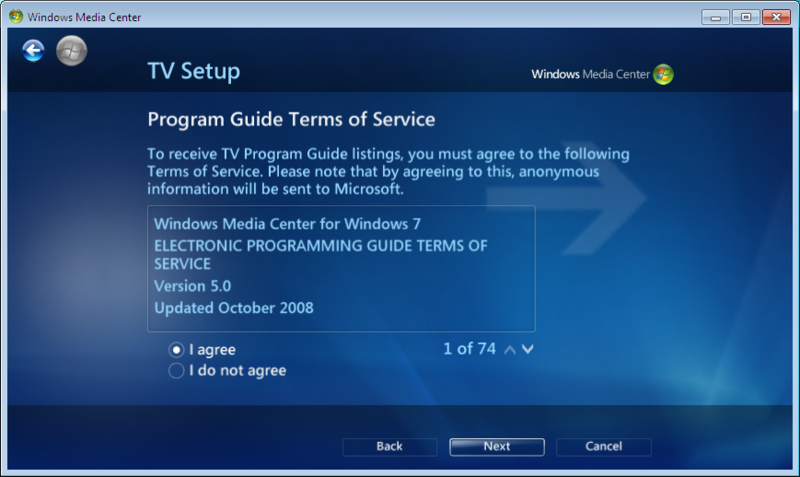 Launch Media Center and navigate to Settings, TV, Setup TV Signal. 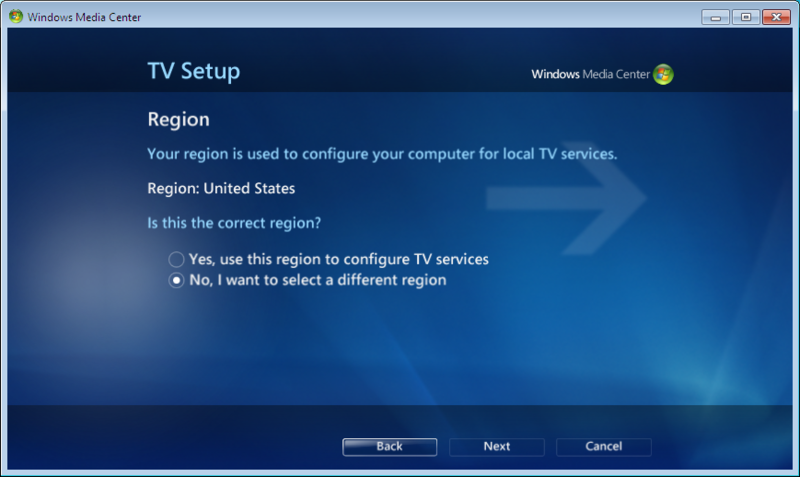 We want to set up Media Center using the correct region, Canada. If Media Center doesn’t automatically detect that you’re in Canada, be sure to select a different region and choose “Canada”. Enter your postal code, and agree to the terms of service (assuming you do indeed agree to the legaleze). 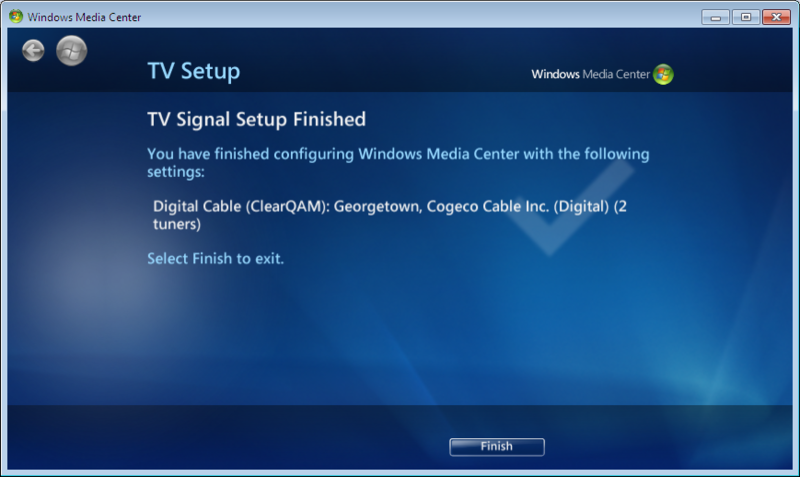 At this point, Media Center will configure all of the signal types that were detected. 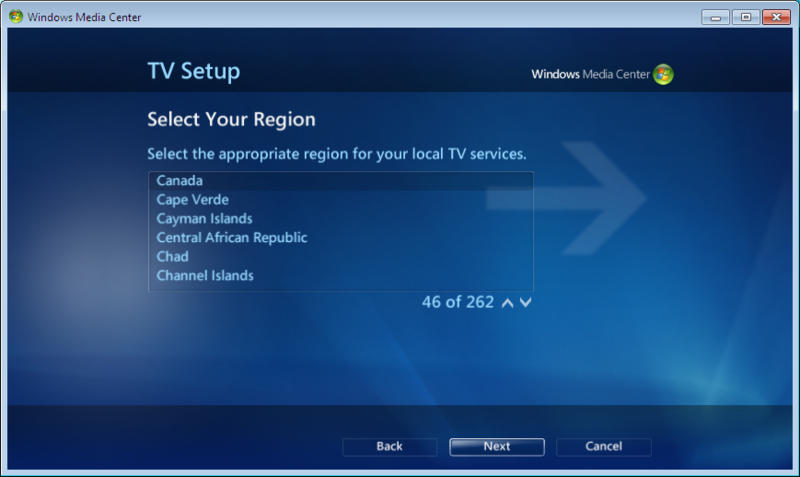 For any cable or satellite tuners, it will automatically link to the guide data for the region. For digital antenna (ATSC) it won’t find any guide data since it’s not officially supported. No worries, we can add in guide listings later. Next, Media Center will scan for ATSC and QAM channels. This process took awhile for me, up to fifteen minutes. Congratulations, your tuners are now set up! However at this point, you likely won’t have any guide listings associated with the channels that were detected via the scan. For those of you who have used the Vista hack, you may like me be pleasantly surprised by the way the guide works now. For each channel on each tuner you can specify which guide listings should be used, which is incredibly flexible. Media Center also now has some much-welcomed logic in the Advanced Record Settings that allows you to specify that any given recording should be recorded in HD Only, HD Preferred, SD Only, or SD Preferred. Because of this feature, I personally would recommend that you always attempt to associate your high-definition digital channels with listings from your cable company’s high-definition channel lineup or the US over-the-air listings so that the recording logic works properly. I’ll walk you through how to set that up. 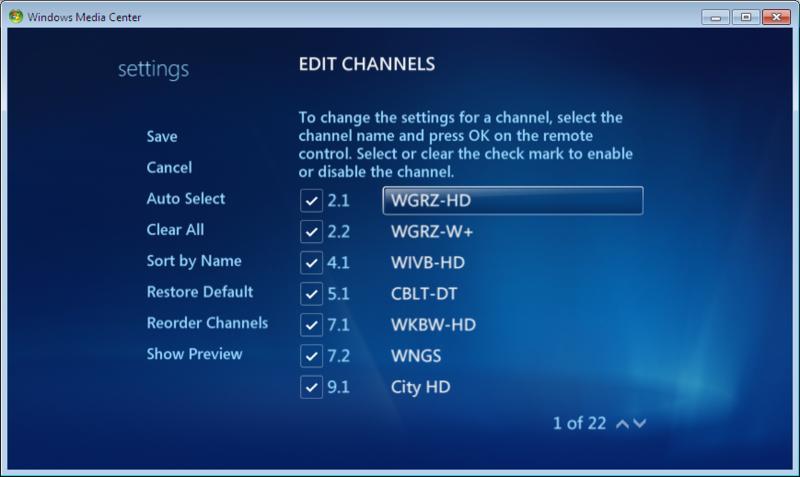 First, navigate to Settings, TV, Guide, Edit Channels. Select the channel that you want to work with by clicking on the callsign of the station. You’ll now be taken to a list of all the channels that your Media Center is aware of (including channels that were set up via other sources, such as Analog Antenna, Satellite, or my multiple guide listings hack). This list is organized alphabetically, and you can type in letters to skip to the appropriate point in the list. Select a channel with HD listings. 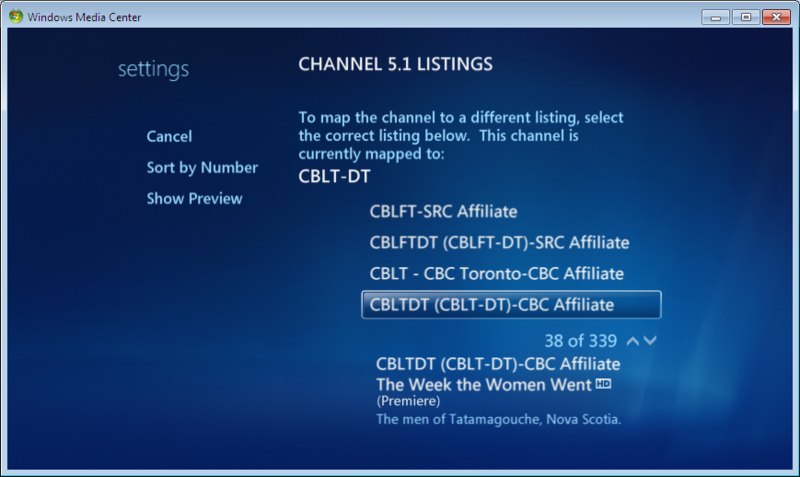 If you select a channel that also comes in via some other source (for example you get CBC Toronto on both cable and antenna) you will be presented with the option to merge the guide listings or to copy the listings. Select “copy” so that you can manage the high definition channel independently. Once you’ve selected the correct listings, you’ll now see that the listings are associated with the digital ATSC or QAM channel. Click Save. Click on save, and at this point you can keep assigning channels or you may choose to go to the guide and test things out before continuing. 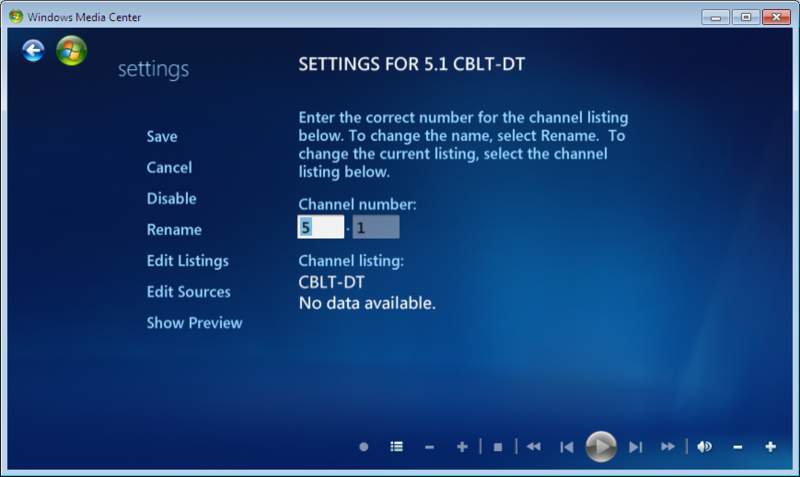 Once you assign guide listings to all of your ATSC channels, you’re done the setup and should be able to enjoy pristine high-definition recordings on your computer and throughout your home on your extenders. I’ll try to capture some key answers that come in over time here in this section. To kick things off, here are some things that came to mind for me. What happens if I select “Merge” instead of “Copy”? I’ve found that by selecting merge, Media Center assumes that all sources for a given channel are standard definition. 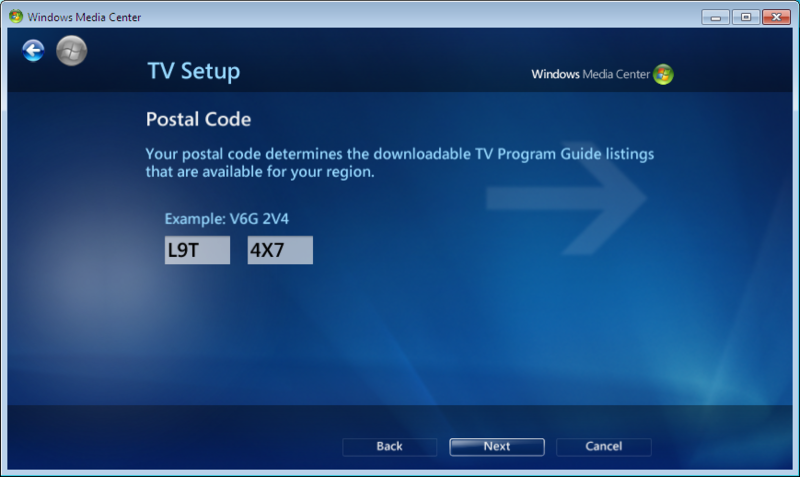 Doesn’t Media Center support Analog Antenna in Canada, and can’t I use those guide listings? Yes analog antenna is supported and you’ll get the listings for your local channels, but because it’s analog Media Center will assume that all channels that use these guide listings are standard definition. But isn’t it incredibly stupid for Microsoft to support Analog Antenna but not Digital Antenna, given that analog channels are all shutting down and digital is the government-mandated standard for all of North America? Media Center didn’t automatically detect all of the ATSC channels that I’m able to receive, is there any way I can manually add them? One of the users at digitalhome.ca maintains a list of all the channels that you should be able to receive in major centers of Canada. 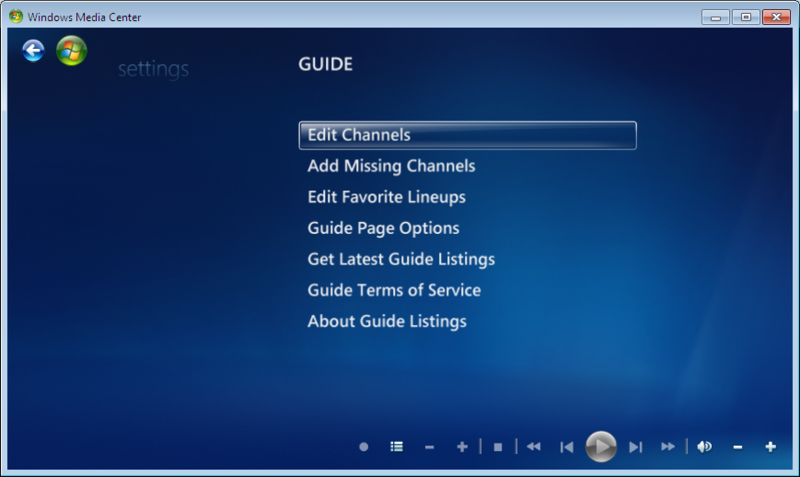 You can use these lists to manually add stations to media center using the functions in Settings, TV, Guide, Add Missing Channels, Add DTV Channel. I’m not able to find guide data for all of my over the air channels, is there any way for me to get guide data for more channels? Yes, you can force Media Center to load in guide information from any region using my multiple guide listings hack. For example, my cable provider Cogeco doesn’t list many of the Buffalo-area over the air stations since they source their high definition content from Detroit instead. I added the listings for Buffalo over-the-air digital antenna to Media Center using the multiple guide listings hack, and used those to complete the mapping of my channels. Peter, I tested in Windows 7 RC. My ATSC tuner is Hauppauge WinTV –HVR MC Model 1101. Without any problem I was able to succeed with the configuration of MCE with ATSC tuner for Canada. I am living in Toronto and my antenna able to received eight channels in my HD TV. All of them are Canadian HD. But, Hauppauge tuner can receive only six HD channels. (CBC, CTV, OMNI1, OMNI2, CBC-F, CITY-T). My HD TV receiving GLOBAL, SUN TV in addition to above mentioned channels I think my Hauppauge tuner is not powerful enough to receive those channels. I may have to fine tune my antenna and test it again. I am unable to test the "multiple guide listing hack" because I couldn’t get US HD channels. I test the recording and it is working fine. This hack is very easy and it looks like out of the box. I was tried previous hacks. None of them worked for me. Thanks for your great work. Peter, you are a god among us. I have the Windows 7 RTM (the real official non-torrent one) and your instructions worked PERFECTLY! Thank you for your contribution! The only thing your instructions don\’t mention is the PlayReady thing. I installed it when I was asked. This worked great – for some reason with the exact same HW config, I now get more HD channels (including WNLO from US) with my little ATI HDTV antenna. I\’m looking fwd to getting an HDHomerun if I ever get time to get some coax and an antenna up into my attic. Three HD streams would be amazing. Hello,I live in Denmark and we have QAM cable tv. Can I use this method to receive QAM channels in MCE in Denmark?? Thanks for the instructions on enabling Qam here in Canada. I have a question I have one channel the windows media centre says it is “Service is Scrambled” but my TV can tune it in. Is there an encryption key that media centre tracks? 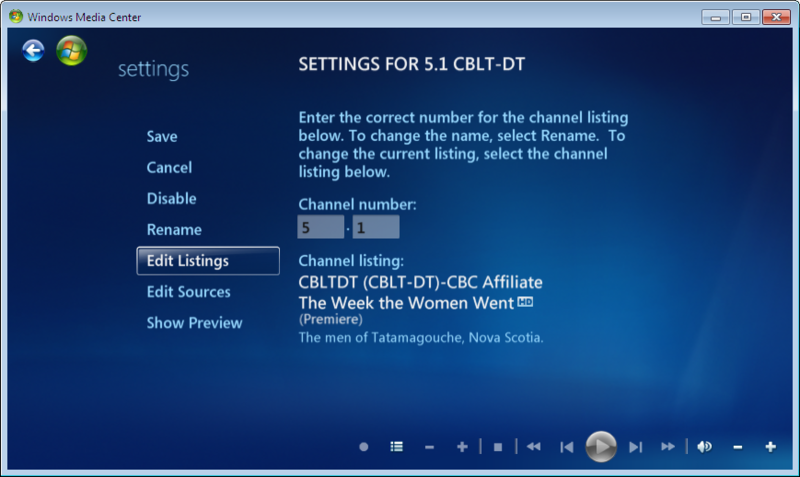 The channel is TLC, on Cogeco in Hamilton, if it makes a differnce. Thanks again for sharing your knowledge, much appreciated. I don’t have cable, just an ATSC antenna. 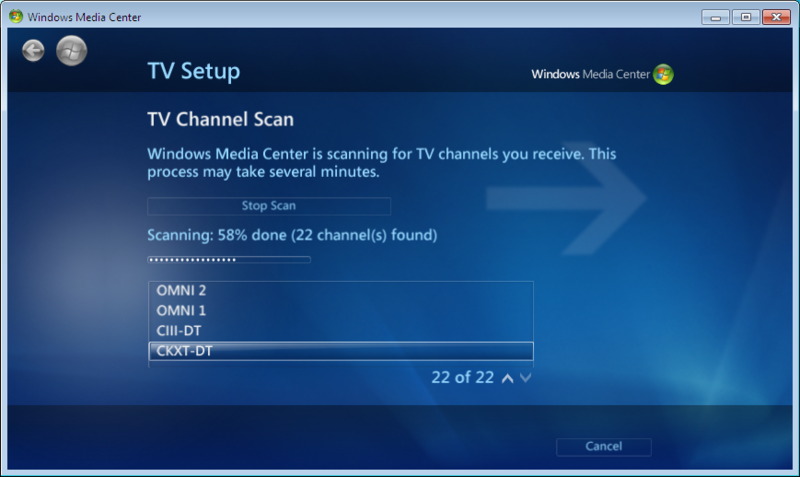 I ran your batch file but I still get the message that Windows Media Center is unable to determine your TV signal configuration. My antenna is connected and we have lots of channels on our DTV downstairs. Does your method only work if you have cable as well? For ATSC-only setups I think it’s better to use this method. That said, it should have worked. What tuner card are you using? you seem lile you know what you’re talking about!